Recent studies have shown that protein from hemp seeds is the best option for vegans and vegetarians. So far, many medical doctors and nutritionists stated that vegan and vegetarian diets aren’t good enough for our health because our organism needs certain amount of animal protein. This is false. For example, 100g of hemp seeds have more protein than a regular filet of chicken, beef or fish. The best way to obtain all the protein of hemp seeds is to follow a “cold process” to get fine powder. You can use your grinder for this purpose and add the powder to your food or shakes. Or you can press the seeds to remove the oils in case you don’t want to eat them because you are following a diet. But the seeds still will contain about 10% of the original fat content. Moreover, the taste is very nice: it is earthy and nutty. Besides being tasty, it contains the nine essential amino acids, the fiber and the healthy fats and minerals our organism needs. 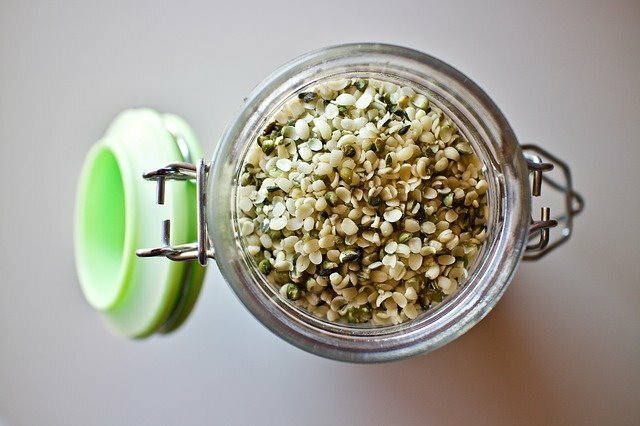 The amino acids from hemp seeds are equal to egg whites or soy. However, another study has shown that hemp has less amounts of the amino acid named lysine. However, the same study says it is the best option for those who prefer unprocessed protein. 30 grams of hemp seed protein has (more or less) 120 calories and up to 15 grams of protein. It is true that these levels are inferior to soy or pea protein powder. But these two products are processed and, normally, vegans and vegetarians prefer unprocessed food. Hemp seeds have omega-3-acids. Moreover, the seeds have these acids in the most correct ratio: 3/1. It contains Omega-6 and Omega-3 in a 3/1 ratio. When it comes to Omega-3, a very important compound, we must warn the people about the importance of it. If hemp seeds contain an ideal 3:1 ratio of Omega-6 to Omega-3 acids and you think that most westerner diets have an unbalanced 15:1 ratio of these fats, is easy to understand that this wrong type of diet drives to many chronic problems like heart disease and cancer. Most food we eat lacks the correct ratio but our organism needs a correct balance between polyunsaturated and saturated fats. Millions people eat too many saturated fats which lack Omega-3. Omega-3 is only available in salmon, quinoa, avocado, walnuts and a few other foods. But hemp seeds contain a lot of this polyunsaturated fat. Eating hemp seeds, which have lower omega-6 to omega-3 ratios will be useful to have the correct balance we need and our heart will appreciate it. The benefits of consuming hemp seeds go much further than consuming the perfect ratio of Omega-3 and Omega-6 acids. Hemp seeds have a lot of fibers, minerals such as iron, calcium and sodium, and many different vitamins, such as E, D, C, B1, B2, B6 and A. It has quite a few minerals such as phosphorus, copper, zinc, magnesium, calcium and manganese. And moreover, it contains a compounds named lignanamides , which have excellent antioxidant capacities. Fiber from hemp seeds alleviate those persons who suffer from immune deficiency diseases. It is an excellent way to enhance our digestive system too. Having so many benefits, hemp seeds are being used as a great nutritional complement for some sick people who have deficiencies as a consequence of tuberculosis. Tuberculosis is a disease that blocks the natural capacity of our body to get the nutrients from the food. Hemp seed proteins erase this problem. In case you think these abilities are not enough, let us remind you that hemp seed consumption protects your immune system, your cells and skin, the natural bloodstream, the tissues of your body, mitochondria and all your organs. Hemp protein powder is a perfect protein with antioxidants, minerals, fiber and heart-healthy unsaturated fats. Once it has been proven the ability of hemp seed protein as a super food, we must consider other important items. Millions people from all over the world and especially the poorest countries, base their daily diets on rice. Rice is very cheap and easy to grow. However, it needs a lot of water and is not earth friendly, which is something that doesn’t occur with hemp; a plant that doesn’t need herbicides or pesticides and can be used to naturally erase weeds from the soil. And what is even more important: it doesn’t need as much water as rice. But unfortunately, even hemp protein has an “ugly face”. Why? Because it contains much oil and the industry uses hexane to extract the different components and produce fine powder. The only problem oil has is that people who are following a diet don’t want it. Because of this, these people tend to buy processed hemp seed powder, which has been treated with the previously mentioned hexane to get rid of the oil. And remember we already said hexane is no good at all for your health. Hemp seed protein powder is very easy to use and many people buy it in this format for that reason. In fact, you cannot use hexane if you want to get an organic certificate for your product. Therefore, if you want to get all the benefits from the protein of your seeds, simply cultivate your own hemp (male and female plants) and obtain your seeds. After this, you simply must use your grinder and obtain fine powder. It will be natural, tasty and very healthy. Don’t buy hemp seed protein that has been processed if you can do it yourself. Roughly speaking, animal proteins are easier to digest than plant proteins. However, the most recent studies have proven that between 91 and 98% of the protein contained in ground hemp seeds is completely digestible. Your body will be able to use all the amino acids from hemp seed proteins. These are very good news for your different organism functions; above all the maintenance and repair. Hemp seed is so easy to digest because it has the proteins named edestin and albumin; both compounds that break down very rapidly. It is also true that some researchers consider hemp seed protein is very good; but not better than simple lentils. A good tip is mixing your hemp protein with rice protein and pea protein. Because hemp protein has not the amino acid tryptophan and rice and pea have a lot of it. Moreover, yellow peas contain remarkable levels of lysine; very rarely found in other vegetables. As we said before, hemp seeds have most amino acids. But it is also true that it has little amount of tryptophan and lysine. Therefore, mixing rice, pea with hemp seeds is the perfect combination for your health. Many body builders do it because they know their muscles will grow faster and more. Do you want an example? Imagine yourself eating a delicious Spanish paella. A good paella contains, among many other products, rice and peas. Once you are done, add some ground hemp seeds and that is all! You will be eating proteins from rice, peas and hemp at the same time.